Baccarat Glass was established in 1765 by the Bishop of Metz who wanted to encourage industry in the little village of Baccarat, some 250 miles east of Paris, France. The Verrerie de Sainte Anne at Baccarat made all kinds of utilityglassware(windows, bottles, tableware) and flourished for many years. They survived the French Revolution (1789) but struggled through the Napoleonic Wars (1812-1815). In 1815 the great French glassworks at Voneche in Northern France found itself outside the new French frontier in the newly created country of Belgium. The owner of Voneche, a Parisian named Aime-Gabriel D&apos;Artigues, bought the Baccarat glassworks so that he could re-establish his business in France and continue to serve French customers without paying heavy import taxes. There is a story that he struck a deal with the King of France to reduce his import taxes from Voneche in return for setting up again in France. The new company Voneche-Baccarat focussed on high qualitylead-crystal glassand over the past 180 years Baccarat have developed many new techniques in making the finest crystal glass. In 1822 D&apos;Artigues sold the glassworks and the new owners set up the Compagnie des Cristalleries de Baccarat (keeping Voneche as part of the name until 1843). It soon became and remains today, the foremost glassworks in France. The company won medals at major exhibitions in Paris from 1823 onwards. Baccarat is famous for its wonderful crystal paperweights, its superb crystal glass tableware, for 19th century colored lead crystal glass and "e;opaline"e; ware, for beautiful decanters and bottles, and for superb leadcrystal sculpturesof animals and birds. The Bohemian/Venician technique of embedding millefiori canes was taken over by Baccarat in the 1840s and their lead crystal glass paperweights with millefiori designs surpass anything produced in that period from Bohemia or Venice. The technique of embedding cameo sulphides in paperweights, was raised to a fine art by Baccarat in the early 19th century, and continues to be used today. 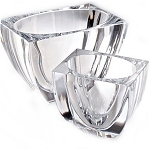 The Baccarat company has a reputation as a caring employer of generations of glassworkers. The small town of Baccarat is almost exclusively dependent on this glassworks, and is a delightful place to visit.